A Cornish council will have to write off £100,000 it has spent developing a regeneration plan. 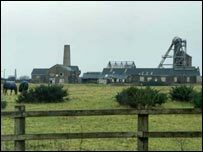 Kerrier District Council's action plan set out guidance for the area around the former South Crofty tin mine over the next 20 years. But the owners of the mine near Redruth challenged the plan at the High Court in London. Following legal advice, Kerrier now says the plan has been dropped and will have to be drawn up again. Mark Kaczmarek, the council's portfolio holder for strategic land use, said the council would have to write off about £100,000 it has spent developing the action plan, which includes houses, offices and leisure facilities. Crofty Developments, a partner of mine owner Western United Mines (WUM), objected to the plan because it felt it had been left out of the consultation process. Director Charles Stericker said: "I am very pleased that Kerrier has announced this fresh start and look forward to working with them on their new plans." He said that a working mine would bring "enormous benefits" to the area. He said: "With modern mining methods, the mine's surface no longer has to look like a wasteland. "But the development that takes place has to be done in close collaboration with the mine's owners. "I believe that, with Kerrier's help, that can be achieved." WUM aim to re-open South Crofty as a working tin mine in 2009, 11 years after it closed.